Linaria 'Fairy Bouquet' is a compact annual flowering plant growing to 20cm tall with miniature snapdragon-like flowers in cream, apricot, yellow, mauve and purple colours. Ideal for planting in rockeries and pots. 1600 seeds per packet. 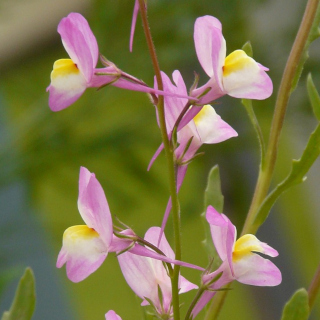 Linaria maroccana is native to Morroco, but has become naturalised in other areas including parts of California. The fairy bouquet variety has obtained the award of garden merit from the Royal Horticultural Society. Linaria flowers can be used as a cut flower in mixed flower arrangements. The nectar produced by Linaria flowers will help to attract beneficial insects to the garden including hover flies and parasitic wasps. Choose a growing location that receives full sun for optimum flowering, if growing in warmer climates a lightly shaded position may be preferable as plants can become heat stressed if planted in full sun. Linaria is easy to grow and drought resistant once established. These dainty flowering annuals are ideal for adding colour to mixed borders in cottage gardens, or for adding to rockeries and container gardens. In cold and mountainous areas of Australia sow Linaria seeds any time during Spring. In temperate regions sow either from early to mid Autumn or from early to mid Spring. In subtropical and tropical areas of Australia sow Linaria seeds from early Autumn to early Winter. Surface sow Linaria seeds then sprinkle growing mix over the top to cover the seeds lightly. Press down gently to ensure good contact between the moist growing mix and the seeds to help prevent them drying out between waterings. Thin seedlings or plant starts about 15cm apart to give them room to grow. Water regularly until plants are established. Make successive plantings several weeks apart during the growing season to prolong the duration of the flowering. Most Linaria seeds will germinate 10 to 20 days after sowing. Linaria plants will begin to flower 12 to 14 weeks after sowing.